We meet our protagonist in her last few days, as she looks back over her life and all that’s happened. Many a preacher has criticized her for those four dreadful words – but is this fair? Would you want your bitterest words to be inscribed on your tombstone? Like all of us, she wonders if things could have been different. Could she have changed the course of her life? Could you? How will you be remembered? What has shaped and defined your own life? Your family? Or the loss of a loved one? Your job? Or trouble finding one? Your suffering? Perhaps an illness or cancer? Your friends or even your foes? Perhaps a divorce? 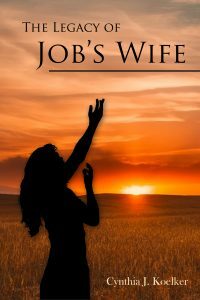 With these four fateful words Job’s wife begins her difficult journey . . .
It’s true, those were my words. How could I forget the day they’d crossed my lips? I’ve had a lifetime to remember. Of course, he’d recorded my words long before I happened upon them, but not so long that I was whole again. My heart lurched back to those bleak, those terrible days, when I thought my life was over, wished it to be so. But my plea evoked no ending of life. In a strange way it bespoke a beginning – a Before and an After. Though I could not see it then, now that the sunset of my years is upon me and my vision dims with age, I see more clearly. My understanding and hope grow stronger as my limbs weaken and wither. Those words again, haunting my life, my thoughts, my prayers. There was a time when I suffered from them, my heart knotted tight in the agony of the utterance. Could I have held my tongue when my very soul cried out in the implacable silence of a black and bottomless grief? Yet those words, whispered in weakness, led to repentance and strength. I thought I’d known God, but I’d known nothing. As new layers of awareness embraced my spirit, I saw my need, my humanity, and finally understood his love. We’ve considered it often over the years, Job and I, whether there could have been another way. Was it a blessing or a curse, to be visited with sorrow upon sorrow? In his suffering, Job came to know God, and with time shared his acquaintance with me. I remember the Before and am ever grateful for the After, but between the two stood unbearable loss. Two lives, intertwined, his tale well known, mine much the same – except at the point of unraveling. With but few days left to share my story, I remember it one last time for my daughters and granddaughters, and generations yet to come. I speak for the women. I speak for the sufferers. I speak for those on the precipice, about to curse God and die.